Like many people as I work from home I tend to do a lot of work from my phone, whether that be replying to emails or updating social media. I can't be on the computer 24/7 (although sometimes I feel like I am) so I rely on apps on my iPhone to help me a lot with keeping productive throughout the day. Over the years I've had many different apps which help keep me organised and productive so I thought I'd share the apps I use the most to help when working from home or on the go. We all know about social media and editing apps so I won't mention those, you can find some useful apps for bloggers here. I use PayPal daily to keep track of outgoing and incoming payments as well as sending invoices. Its extremely useful to have the app on my phone as it means I can access it for what ever reason instead of having to log in on the laptop. This app is useful not only for bloggers but when working from home in general. It allows you to sign documents quickly and on the go which is useful if I can't get to the computer. I do so much in Google Drive, not only in my personal life but also for my blog work. I use it to keep track of my income, spreadsheets, work that needs doing, my bills, etc. The Google Drive app has been really helpful when I can't get to my computer and need to quickly access something or send someone a media kit or something. I store all of my work files as well as personal and blog images via dropbox so they don't take up space on my computer and it means they're easy to access and share from other devices, plus I don't have to worry about slowing my iMac or laptop down with too many files. This app is one of my most used as I like to schedule blog posts throughout the day across social media. I don't schedule everything as I prefer to tweet in the moment but for sharing old posts I find this app so useful. I will schedule posts when I climb into bed each night for the next day or couple of days. I really like using the app compared to the website and it takes no time at all to do. I actually use Hotmail for my blog emails however I do have a gmail account which is llnked to my PayPal account and I do use that email address for purchases and other things and find the app a lot easier to use than the iPhone mail app. I like using Spendee to keep track of all of my incoming and outgoing expenses. Even though I do have an excel spreadsheet on google drive for all of my bills each month i do like to see how much I spend and on what so the app is great for that. I like using this app for personal events too however it is really useful for work. I make note of all the key events for my blog such as projects which need completing or events I'm going too. It's also handy for another company I work for as I help manage their social media and I track all of their events which I need to promote across the year. This is an app which I've only recently started using and if you know me I like to be minimal. Its basically a to-do list but it also links with your calendar which is great as I'm always adding things to that. As much as I love writing my lists down in the notes app on my iPhone I also like using this app for daily to-do lists as they're easier to keep track of and you can mark them off once completed. Otherwise they just still there in the notes app where I have 100s of notes uncompleted. This app will simply your life. I love using Evernote to jot down blog post ideas instead of having 100s of notes in the note app this will then link to any device so you can access it easily. I also use it to create checklists on the go as well as take photos of receipts to keep them stored and then access them online. I came across this interesting infographic by Dell below which shows the day in the life of the mobile productive employee and found it really interesting.that 58% of mobile workers believe they will rely more on their tablet this year than they did last year, which made me wonder if people will need to use their virtual desktop at all in the future. 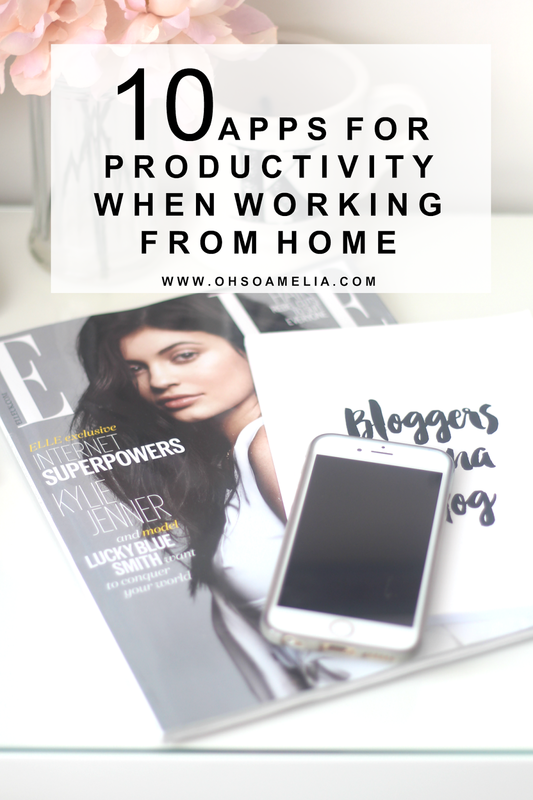 What apps do you use for productivity when working from home or for blogging? You have just reminded that I need to download the PayPal app to my phone. I'm awful for not using apps, I'm not sure why as I think they would help me on a daily basis. Love the sound of some that you've mentioned. Great picks I use a couple of these! I also recently found an app called Do! which is basically like a checklist app and its so so useful! Ooh, this is super useful. Going to note them all down as will be starting to work from home soon! I need to get more productive, these apps are great and I am off to pin them for future reference. Great blog post! This is a great list. I already use Googe Drive,PayPal & have dabbled in Evernote but like the sound of Minimalist. Got to love a list that you can tick things off.